Well suited for areas with two-way traffic, this double sided resinwood bench is available in both in-ground mount and surface mount models. 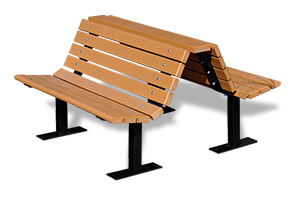 Classic clean-line design combined with environmentally-friendly resinwood slats, offered in a host of popular color options, ensures this bench will make a positive impact on its environment. Zinc coated hardware comes standard.